The sun’s UV radiation is a nightmare for sails. The invisible rays destroy sail fabric and stitching in sneaky, subtle ways, making it hard to detect until it’s too late. The Quantum Service Team explains how to spot damage before it becomes catastrophic, and, most importantly, how to prevent it. Hiding in Plain Sight - An otherwise decent looking sail is actually fraught with catastrophic damage. Read on to see it. It’s no secret UV rays are harmful. Similar to our skin, the long-term damage they cause isn’t always obvious. Where you live and the amount of time your boat spends in the water will factor into your prevention and maintenance plan. For example, a boat in the Gulf Coast exposed to year-round sun will need its UV cover and/or stitching on its jib replaced more frequently than a boat on the Great Lakes that is in the water only for the summer season. Before we jump into the signs of damage and prevention tips, here is a brief tutorial on UV rays and what they’re doing to your sail at a molecular level. UV rays–or ultraviolet rays–are part of the light spectrum that is not visible to the human eye. These high- energy, high-frequency rays that come from the sun are broken into three categories: UVA, UVB, and UVC. The earth’s ozone absorbs all UVC and a lot of UVB rays – which are the most harmful. UVB rays are most responsible for our suntans, sunburns, and, subsequently, skin cancer and sail damage, but UVA rays also contribute at a lesser degree. 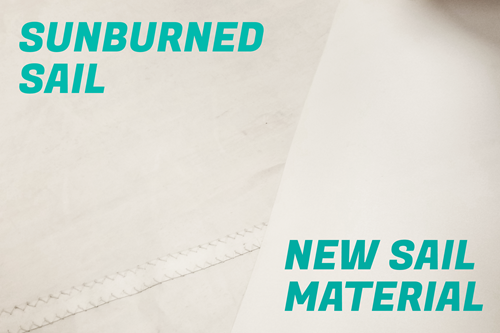 As the UV radiation breaks down the sail fibers and materials, they become weak and vulnerable to tearing and, ultimately, catastrophic failure. The sneaky part? It’s not always easy to see. If you’re not looking carefully, you can easily miss the signs. 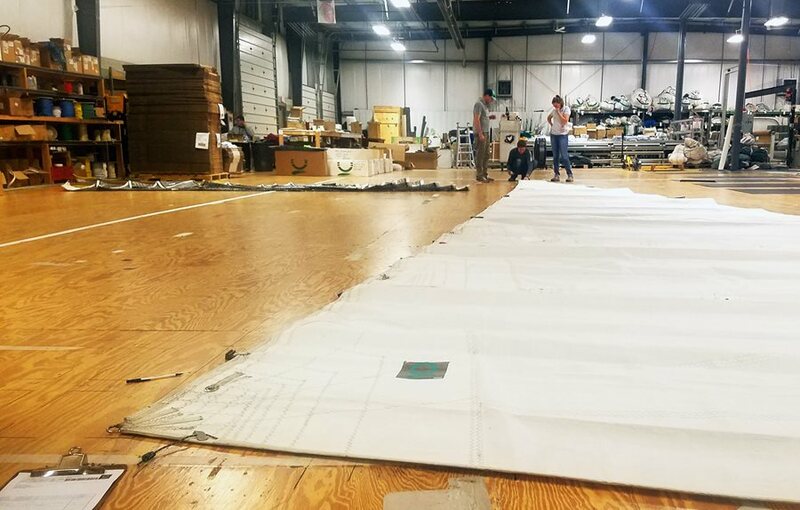 This is why it is important to have your sails regularly inspected by a pro and to work with them to make sure you have a holistic prevention plan. A prevention plan includes more than just having sail or UV covers; it also ensures proper fit, use, and recommendations on when to stow your sails below. We’ll start by helping you identify some telltale signs that your sail might be in trouble. The stitching on your sails and canvas is especially susceptible to UV degradation and is usually the first element to go as thread is made up of fewer fibers. The good news, if it is caught early and it’s just a small section, it can be re-stitched without having to sacrifice the whole sail. Look for large sections—more than six stitches in a row—that are un-stitched and appear to get worse with little effort. Put your sail stitching through the “pluck test.” Take an awl or similar tool and pluck at the stitching in the area suspected of damage. The thread should stretch and pull. If it breaks easily, you’ll want to see your sailmaker ASAP. This short video clip demonstrates how healthy thread should behave compared to sun-damaged thread. UV damage doesn’t just weaken the material, it also affects the color. Woven Dacron fabric will take on a gray hue the more and more damaged it becomes. If a strip of your sails doesn’t fit under the sail cover or your furled headsail doesn’t have a UV cover, that strip of material will degrade and discolor with repeated exposure, giving your sail a tan line. This is probably the most obvious sign of UV damage; it also signals the most damage. Monitor accessories on your sail such as tell tales and sail patches. Unfortunately, if these are discolored, it’s likely you have other major damage as well. Warm colors such as reds, yellows, and oranges fade first, followed by the cool spectrum of blues, greens, and then black. As UV radiation breaks down the sail fibers and material, the sail becomes too weak and brittle to do its job. It can be deceptive, however, as even in its weakened state it’s still hard to see with just your eyes that something is wrong. If you can tear through the material with your hands in any way, you have a problem. Also take a look at the luff tape. Patches with abrasion are another key indicator of UV damage (see photo example). Where to look: The aforementioned warning signs don’t always happen to the whole sail or at the same time or rate. An ill-fitting sail cover or an incorrectly furled headsail may cause damage only to the portion of the sail exposed. Take a look from time to time at how your sails are stored onboard, and take note of anything that might be getting unintended exposure. There isn’t a lot you can do when your sails are in use. 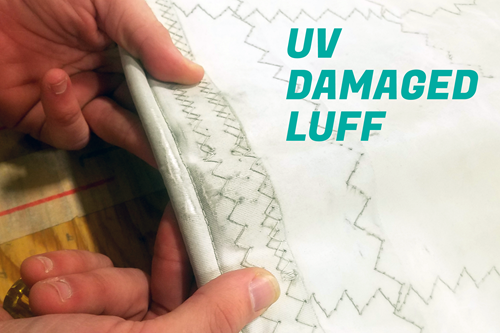 Just be diligent about storage and inspecting them for damage, taking a close look at luff tapes, corner patches, and stitching. As soon as you’re done sailing, cover your sails. There a few options out there depending on your needs. For mainsails, sail packs and the horse-blanket style are common. Make sure the cover is sized appropriately for your sail and that it covers all of the sail. If your headsail lives on a furler, consider taking it down if you won’t be using it for a few weeks. While the sail is up, preventive options range from jib socks (a tube of canvas that is pulled over the sail) to UV covers. 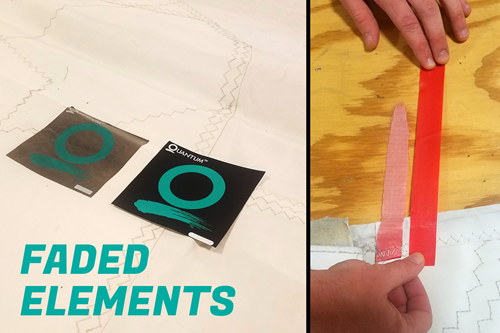 UV covers are strips of sacrificial fabric (we use a specific Sunbrella fabric) that absorb the UV rays and keep them off of your sail. UV covers are commonly used on furled headsails and on heads or clews of mainsails that stick out when furled in mast or in boom. IMPORTANT NOTE: If your sail covers or UV covers aren’t properly used or maintained, they lose effectiveness. Poorly fitted sail covers account for a great deal of surprise UV damage where a strip of the leech doesn’t get covered. Additionally, many embarrassed sailors have walked away with big repair bills from furling their headsail the wrong way, rendering their UV cover useless. If you’re unsure about whether you’ve got the right solution for your needs or that the cover is fit properly, always ask! Snap a few photos and send them to our team. If we’re able, we’ll come inspect your boat and get you straightened out! We can’t harp on this enough: Get your sails and covers inspected regularly! We recommend annual inspections. Regular sail inspections by a professional will help to identify UV damage before it’s too late. While you might be able to spot some more extreme signs, our team is trained to catch the problem in its infancy and before it becomes a real problem. Sail covers and UV covers are still susceptible to UV damage; they’re just a lot more resistant to UV, and, depending on the amount of exposure, they can last four to eight seasons, especially if you take care of them. 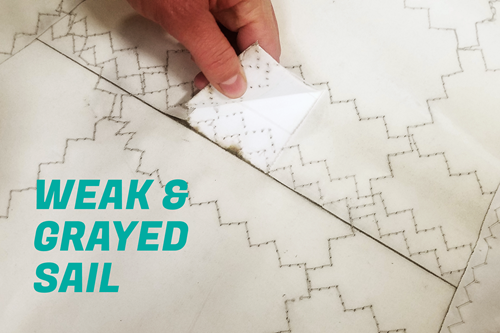 Much like the stitching on sails, the stitching on your sail and UV covers will deteriorate the fastest and will need to be re-stitched more frequently. Keeping up on this maintenance will extend the life of your canvas covers and any other canvas on your boat's dodgers, tiller covers, and even the window panels on some enclosures. Quantum lofts are your one-stop shop for all things related to keeping your sails in tip-top shape and preventing UV radiation damage. Lucas, Jim. “What Is Ultraviolet Light?” LiveScience, 15 Sept. 2017, www.livescience.com/50326-what-is-ultraviolet-light.html.